The problem: If a player jumps while fully contained within a thick (taller than the player) pass-through platform and doesn’t reach the top, he/she is collision-corrected to the top of its surface instead of being allowed to fall back down again. The cause: The test which cancels out collisions between the bottom of the player and the pass-through platform when the player’s base is not fully above the platform’s top edge fails, and a large upwards correction is incorrectly applied. The solution: Add a buffer zone such that the player’s position is only corrected upwards if the distance between the player’s base and platform top is less than a few pixels (we use 5 in this example). The problem: When walking on or falling down to land on a highly sloped pass-through platform, the player may incorrectly fall through the platform. The cause: Collisions for the bottom of the player vs the top of the pass-through platform are disabled when both the bottom of the player plus any other side of the player is intersecting the platform, or the player is moving upwards. The purpose of this is to prevent snapping the player up to the surface when partly inside but not wholly above the platform. When walking up a steeply-sloped platform, the left or right side of the player may be intersecting it slightly as well as the bottom, and the player is moving upwards, so collisions with the top of the platform are incorrectly disabled and the player falls through. The solution: Only count contacts with the left and right sides of the player when considering whether to disable collision detection for the platform’s top edge if the player is moving in the opposite X direction. Ie. if the player is moving right, ignore contacts with the player’s right hand side and vice versa. This will not break the existing code which is designed to check if the player is inside the platform, since if they are wholly inside it, at least one of the left or right sides will be counted as intersecting it whichever direction the player is moving. The additional conditions against preresMoveX and preresMoveY check which direction the player wants to move in this frame. The test of intY (which is the number of Y pixels intersection between the player and the platform) ensures that no upwards correction greater than 5 pixels occurs. Figure 1. The crush/wedge problem. The player’s bounding box is represented by the white rectangle. At some point as the player moves to the right, the player’s top and bottom sides will both be making contact with a platform and the collision detection code will consider the player to be crushed as there is no correct resolution. The problem: Two horizontal platforms are angled such that the player’s top and bottom sides can intersect them both at the same time (see Figure 1). When the player walks far enough to the right, he/she is killed incorrectly. The cause: The collision detection code considers the player to be crushed by the world geometry if the player’s top and bottom (or left and right) sides are touching platforms simultaneously. In this situation, there is no correct vertical (or horizontal) correction that can be applied, so if we don’t mark the player as dead, they will rapidly oscillate up and down (or left and right) as the contact solver fails to resolve the collision on each frame. The solution: Only consider the player to be crushed when one or both of the intersecting platforms are moving platforms. You cannot be crushed by a platform that doesn’t move (the problem of failed penetration resolution is dealt with in the next section). This code is identical to before with the exception that cPmoving is now updated with each piece of geometry tested. The player can now only be crushed by moving platforms, but if you run the updated code, you will see that when the player becomes wedged between the two static platforms when walking to the right, the player’s position is grossly over-corrected to the left as penetration resolution fails to find a good solution. The problem: When the player becomes wedged between two platforms, his/her position is over-corrected when really we want the player to just not be able to move any further in the requested direction. 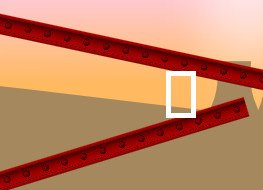 The cause: Referring to figure 1 again, when the player reaches the wedged location by walking right, about half of the width of the player’s bounding box is intersecting each platform. Correcting the player up or down will not help, so the code instead corrects the player to the left by this half-player-width amount – a sudden and unexpected over-correction. The solution: Store the player’s original position before any iterations of the contact solver are executed. If, at the end, the crush point flags for either top and bottom or left and right are set, but the player is not dead, then he/she must be wedged, so completely override the results of the contact solver by restoring the player’s original position stored earlier. This prevents movement in any direction except away from the wedge location (where the crush points will not be set). Astute readers may wonder why we don’t check and correct only one axis at a time. This is because if the player walks between two intersecting slopes (horizontally as in Figure 1), therefore touching the top and bottom of the player, he/she should not be allowed to continue walking on the X-axis, as well as not being corrected up and down in the Y-axis due to the penetration resolution code failing to find a correct solution. The problem: If you are moving left or right and jumping, then intersect with a ladder, you may suddenly move a large upward distance on the ladder. The cause: The problem occurs in the code which determines whether we have just touched down on the surface of a platform which does not allow fall-through (which includes ladders). The check only considers the bottom edge of the player, not the top edge. Therefore we can be incorrectly assumed to have landed on top of a platform when we are in fact inside it (the ladder). A large amount of upwards penetration resolution is then applied. The problem only occurs while jumping because while not jumping, you are considered to be standing on another platform (the one you are actually standing on). The problem only occurs when moving sideways because falling on top of the ladder will apply the fall-through test correctly. The solution: Add a check to the fall-through test to only allow penetration resolution to be applied when the bottom edge but not the top edge of the player is touching the platform where pass-through is disallowed. The problem: When walking down a slope with a steep incline, you can’t always jump. The cause: Jumping when in mid-air is disallowed. When you walk down a steep slope, gravity does not pull you down fast enough each frame to keep you touching the platform, so the code assumes the player is in mid-air and falling (which technically, he/she is). The problem: The player can move a small amount on a low-friction, high-acceleration platform such as ice, jump up and then move very fast relative to the X axis during the in-air movement. The cause: The physics model for X-acceleration of the player is based on the last platform the player was standing on; only Y-acceleration (gravity) is modified to the default behaviour during in-air movement. The solution: The first problem can be improved for low-friction platforms, and the second problem can be solved, by resetting X-acceleration to the default behaviour when the player is in flight. Notice that the first problem is not solved completely, just somewhat improved if the player was moving very fast down the slope. Fixing the second problem is essentially replacing one issue for another: the player can now cheat on high-friction platforms by jumping in the air and moving left and right to escape the “stickiness” (friction). However, this is the lesser of the two cheats as their top speed and acceleration is restricted as soon as they land again. The problem: Jumping while standing on a platform that is moving upwards at high speed causes the player to die (be marked as crushed). The cause: The platform’s upwards acceleration exceeds the player’s upwards acceleration. When the player starts to jump, the platform intersects the player, the top and bottom edges of the player (or the left and right edges) are both touching the inside of the platform at the same time, and since it is a moving platform, the crush flags are set and the player is considered to be dead, then re-spawned. The solution: Make the player’s jump speed relative to the platform’s speed. In truth, this is a time-of-impact ordering problem: the platform should push the player upwards rather than crushing them. However, since we have no TOI ordering code in our project, we will have to fudge the fix. Having said that, an object’s velocity should take into account the velocity of the object it is standing on anyway (think of jumping in an elevator; the jump is normal, you appear to be standing on a non-moving floor because your jump speed is relative to the speed of the elevator). The way we deal with standing on moving platforms in general is a horrible fudge because the player’s speed should be automatically aligned with the speed of the platform, instead of using the per-frame pixel movement calculation we currently employ. If we did this, the problem would never have occurred. Why have we multiplied the upward pixel movement by mScale^2 and added it to the vertical speed? Essentially, we are differentiating the pixel movement of this platform per frame twice: once into speed, and again into acceleration. Solving the false positive on crush detection reveals a new problem: now when you jump while standing on a pass-through platform, if the platform still overtakes you (because it continues accelerating upwards, while you are slowed down by gravity), you can fall through it. In an earlier fix above, we disable collision detection for the bottom edge of the player against pass-through platforms when they are jumping under certain conditions. We need to add another condition: ignore collision detection for the player’s bottom edge while they are jumping but only when the platform they are jumping from is not the platform being tested. This ensures that if we have just been hit by the top edge of the platform we just jumped from, that collision detection remains enabled and we land on it. The net effect of this is that previousPlatform will be the platform we are currently standing on, if we are standing on one, or the last platform we were standing on if we are in flight. In Part 12 we shall move away from platform handling and collision detection, and on to the business of adding interactive game objects like baddies to the game world. There will also be some improvements to the level editor. Until next time! Awesome series. First of all I like the way you explain things. I’m personally not a fan of DX11 and would build your great Simple2d lib on DX9 but that’s just a philosphic point. Continuing this series is a must! Hey, thanks for the nice comment, that makes it all worthwhile! I have 6 more articles planned and there will doubtless be more after that as my head brims with ideas; I’ve been rather busy moving house and then got sick for a while, normal service will resume shortly, the idea is to have a complete finished video game by the end!